The first annual reunion of the Blackhurst family occurred Sunday at Victory park, Jackson, and was attended by thirty-five members of the family. 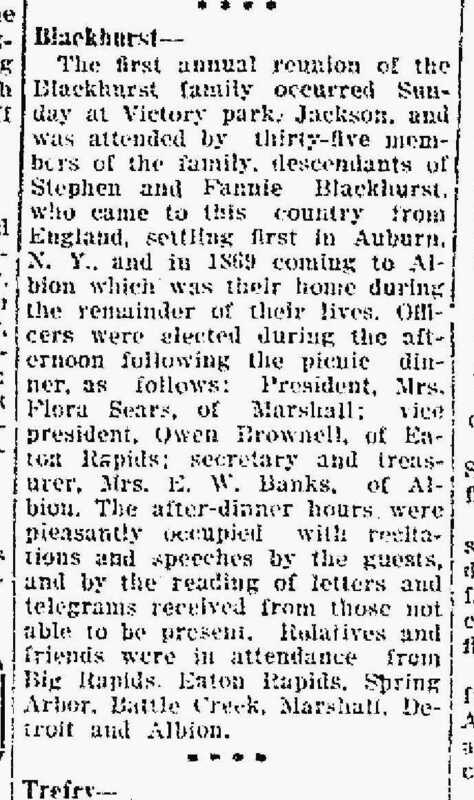 Descendants of Stephen and Fannie Blackhurst, who came to this country from England, settling first in Auburn, N.Y., and in 1869 coming to Albion which was their home during the remainder of their lives. The after dinner hours were pleasantly occupied with recitations and speeches by the guests and by the reading of letters and telegrams received from those not able to be present. Relatives and friends were in attendance from Big Rapids, Eaton Rapids, Spring Arbor, Battle Creek, Marshall, Detroit and Albion. 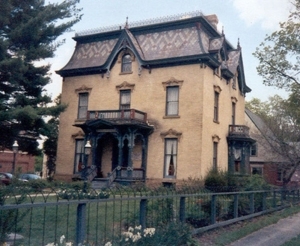 My research did indicate that the Blackhurst did first settle in Auburn, N.Y. However, they were in Sheridan Township before the 1860 Census. [ii] They were in Auburn during the 1855 New York Census,[iii] so they appear to have moved to Albion between 1855 and 1860 and not in 1869. President Mrs. Flora Sears of Marshall: I don’t have a clue who that could be. Apparently from a family line I haven’t traced yet. It is interesting to note that next to the Blackhurst farm near Hall’s Lake was another farm owned by J.W. Sears. 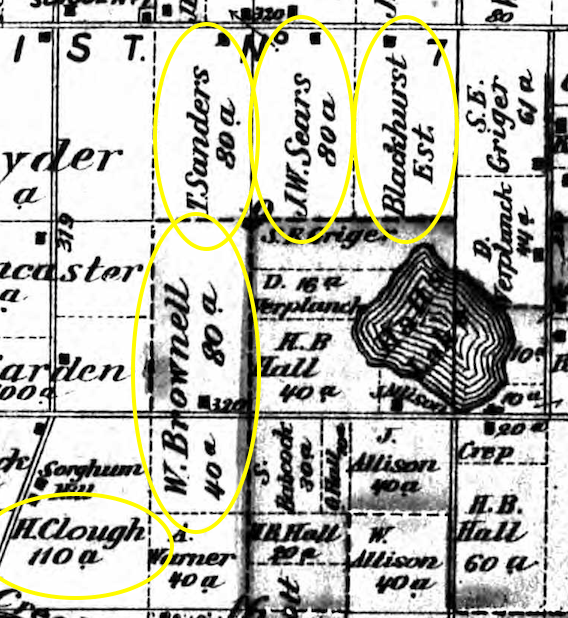 Nearby farms also included Sanders, Brownell, and Clough names known to have married into the Blackhurst family. Vice-President Owen Brownell of Eaton Rapids. Must be Charles Owen Brownell (1870-1962), who was a grandson of Stephen and Fanny. I learned that he lived in Eaton Rapids in 1923. Secretary and Treasurer, Mrs. E. W. Banks of Albion, is Phebe Ann (Eslow) a granddaughter of Stephen and Fanny. I learned she lived in Albion in 1923. In 1923, my 2nd great-grandmother Sarah (Blackhurst) Barber was 76 years old. In 1920 she was living with my grandmother in New York City. 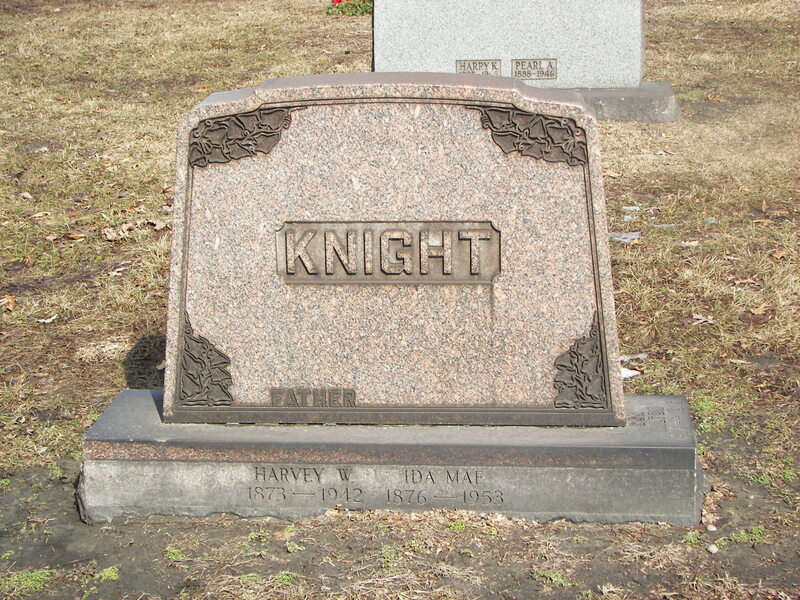 In 1928 she was living with my great-grandmother Ida (Barber) Knight in Detroit. So, Sarah and Ida, could have been there as the “relatives from Detroit.” Donna’s whereabouts are unknown during August 1923 so she could have been there as well. Donna, Ida, and Sarah all lived in Albion at various times so they would have known the people and could well have had a desire to be a part of the first family reunion. My direct ancestors (Madonna, Ida, and Sarah) left Albion and Calhoun County before 1900, and they never spoke of Blackhursts or Albion. It wasn’t until my research that we learned that Madonna was born in Albion, she always said she was born in Detroit. When queried, my mother and uncle said that Ida was born in Detroit. And neither of them recall ever hearing the surname of Blackhurst in their family history. That make me wonder what made them apparently abandon the Blackhurst family and totally lose contact. Maybe I’ll be able to find the Blackhurst Family Reunion of 1923 and learn more. There is hope on that front. This article shows many Blackhurst family members remained in Calhoun County and the Albion/Sheridan township area. Their having a family reunion in 1923 is evidence they wanted to keep their family in touch. Albion is about 1-1/2 hours west of Detroit and the Albion Historical Society is open weekends from mother’s day until September. 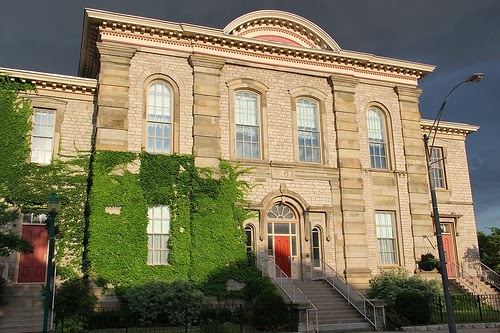 I think it would be a great excursion to visit the Historical Society during my next trip to Detroit and see what they might have. I wish I lived near Albion. Next door to the Blackhurst farm was a farm owned by J. S. Sears. (Possibly somehow related to Blackhurst Reunion president, Mrs. Flora Sears?) One farm beyond that was a farm owned by T. Sanders. Just south of that a farm by W. Brownell. It is like half the names of the Blackhurst spouses came from these neighbors. I would be a fun exercise to look at all of the relationships. In my wanderings, I have found other people for whom The Blackhurst legacy was a big deal. They spoke about the family going back and forth between Chicago and Albion and sharing stories about when Stephen and Fannie left England and came to America and lived in the “wilderness of Michigan.” Maybe they will share those stories with this black sheep Blackhurst descendant. Reach out to other Blackhurst researchers. Visit the Albion Historical Society. 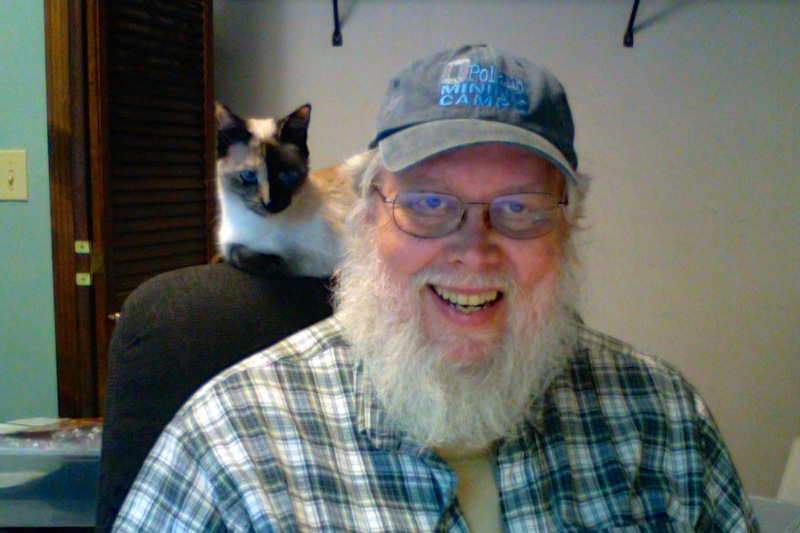 Research – Any records showing John F. Montran or any Montran surnames. Research – Any records regarding the Blackhurst family of Albion particularly prior to 1900. Determine who Flora Sears of Marshall is and how she related. Do a neighbor study of the Blackhurst family and the relationships of Stephen and Fanny’s children’s spouses. [i] Evening Chronicle (Marshall, MI) (Marshall, Michigan, ), Ancestry.Com, 1923-08-12 – Social News / Reunions / Blackhurst. [ii] 1860 Census, Family Search, Stephen Blacklin – Sheridon, Calhoun, Michigan – Line 7. Accessed 25 August 2013. https://familysearch.org/ark:/61903/1:1:MWDJ-W8X. 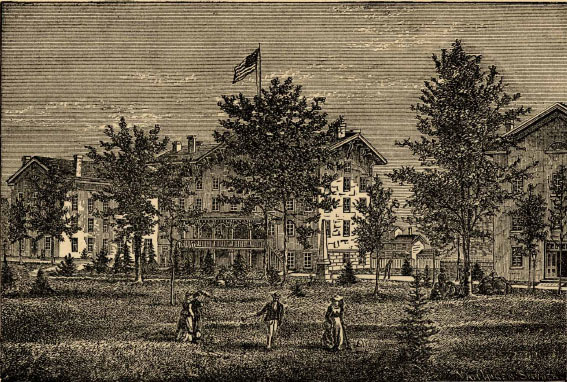 [iii] 1855 New York Census, Family Search, Stephen Blackhurst – Auburn, Cayuga, New York. Accessed 25 August 2013. https://familysearch.org/ark:/61903/1:1:K675-B3M. Mac 2 to FTM 4 Mac 3 was particularly painful). existing files the linkage was often broken. research and found several items regarding Ida’s early marriages. first of two daughters of Franklin (Frank) and Sarah Blackhurst Barber. old living with her parents and her younger sister Eva. I suspect that she actually did marry John. was born 20 Feb 1893. Herman Schcontt, both of Detroit. Detroit so their being married in Detroit makes sense. Manistee Lake in East Lake. it is where Ida & Joseph would have been married. Photo by C Hanchey via Flickr – Some rights reserved. Minneapolis before they were married. and Winnifred Andrews both of Detroit as witnesses. home and/or were the first owners. be protected from access to dangerous chemicals. names, and oral history all fit. indicates her address as 1456 Lawndale. a new (only 9 years old at that time) home. street was renumbered to fit a larger system sometime between 1920 and 1923.
came to live with her and help out. person who will carry their mtDNA (Haplogroup T2b) on to future generations. Search for Montrani instead of Montran in the usual places. Search harder for Montran – Barber marriage records. 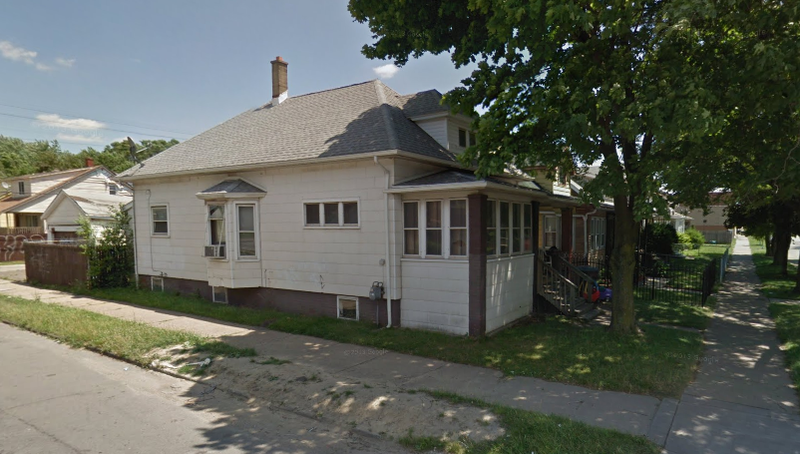 Research what may have been at 374 Third Street, Manistee. Research actual date for street renumbering in Detroit. A Holdsworth – Ida Fisher. There is an adage about always considering sources closest to an event as more accurate than others. The age of my grandmother, Madonna/Donna is a perfect case of that policy. Donna was born 20 Feb 1893 in Albion, Calhoun County, Michigan, to John F and Ida Montran [Montrau]. The 1900 (Madonna used a step father’s name) and 1910 censuses are consistent with that birth year. Donna went into show business. In the 1920 census her occupation was “actress” and her age was 23, although she would have been 26. During the next seven years Donna only aged three years being only 26 years old when her son was born in 1927. Donna doesn’t show up in the 1930 census, due to travel during the census. However, she does show up in an April 1930 Passenger List, returning from Panama, as only 25 years old. She kept that 1905 birthdate through her daughter’s birth in 1932. Sadly she kept to the 1905 birth year when she applied for a Social Security Number in 1937, a mistake which cost her in later life (twelve years of benefits). In the 1940 Census she reported that she was only 36, although she was 47, aging 11 years in the ten years between censuses. I’ll be very interested in seeing what she reported when the 1950 census comes out. I should note that in all records the date, February 20th, was always the same, only the age or year changed. As Donna’s life shows, records closest to the event are typically the most accurate. My 23 & Me DNA results put me (and my mother) into contact with a couple people with whom the only surname we shared was Blackhurst. One of them suggested that their ancestor, William Stephen Blackhurst had a sister who was twelve years younger named Sarah Blackhurst. 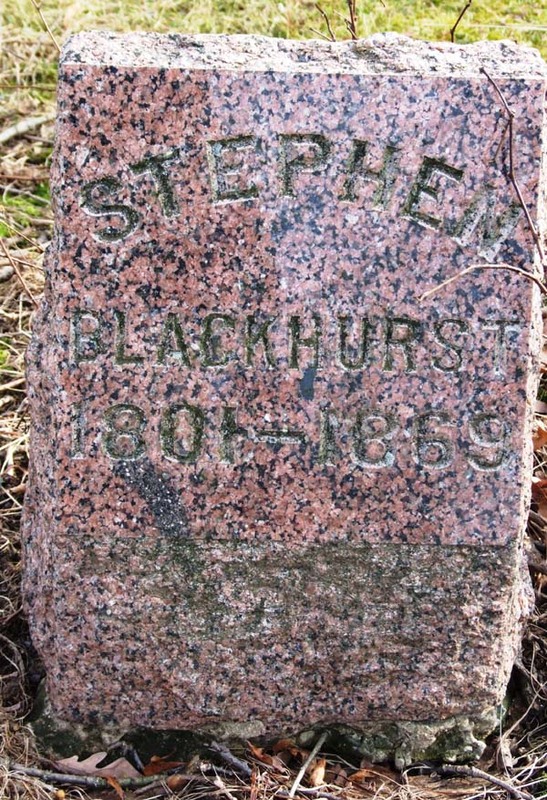 He also indicated that their parents were Stephen and Fanny (Taylor) Blackhurst. 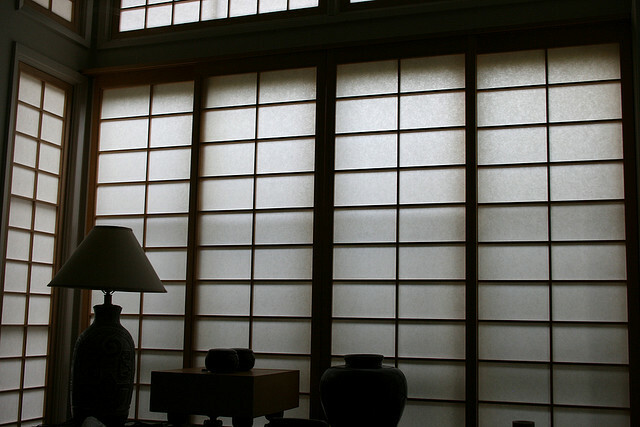 He provided several sources which provided a place for me to look much more closely at my Sarah and his suggestions. I dove in and found lots of new information regarding Sarah that I didn’t know before. I learned that Sarah’s husband was Franklin (I had Frank) Barber. They were married in Calhoun County, Michigan. Sarah’s father came to the states about 1848, then Sarah’s mother and kids came to the States two years later (1850). They settled in Auburn, Cayuga, New York, USA. Somewhere between 1855 and 1860, they moved to Sheridan Township, Michigan (near to Albion). Sarah and Franklin were married in Albion (I’m ordering their marriage certificate) and their two children, Ida and Eva were born in Albion, which I knew previously. Stephen and Fanny are buried in Albion as well. All the pieces connect and I’m certain of the relationship. So, the 23 & Me connection provided the impetus and the clue that opened up a family line I knew nothing about previously. I am definitely looking forward to what additional connections the 23 & Me results will provide. I’ll be writing more about the Blackhurst line after I finish a deep dive into those ancestors.